A great vegetable side dish or Sunday Morning Feast! Hollandaise Sauce: Make sure that the melted butter is at room temperature. Whisk egg yolks in a bowl over a pan of hot, but not boiling water. Slowly add the butter, whisking the mixture constantly. Be careful, if the butter is too hot, or hotter than the egg yolks, you will get scrambled eggs! The mixture will become pale yellow and thick. Remove from the heat and add the lemon juice, whisking it in until all is incorporated. Keep warm. 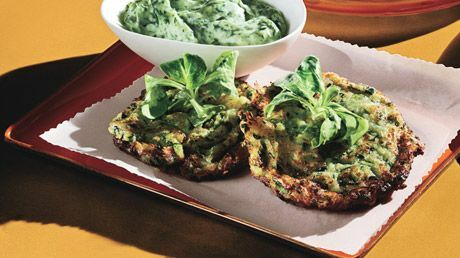 Zucchini Pancakes: Add the beaten eggs to the grated zucchini and a tsp of kosher salt. Mix well. (Grate the zucchini using a simple box grater, using the large holes.) Add the onion, parsley, pine nuts, and zucchini flowers if so desired. Mix well to combine all ingredients. Add the whole wheat flour and mix again. Heat a small saute pan and melt a tsp of butter into it. Pour 4 ounces of the zucchini batterand brown well. Turn and brown the other side. Pancakes should be nicely brown and crisp at the edges. Assembly: Place a zucchini pancake on a plate, top with a slice of the cooked meat and finally top with a poached egg. Drizzle a bit of the Hollandaise Sauce on top of the egg/meat/pancake. Sprinkle with paprika. Serve hot. This is a great Sunday Morning dish! The zucchini batter can be made the night before and refrigerated. Then in the AM you can check the consistency and cook the pancakes. I usually serve two for each person. But be prepared, some may ask for more of the zucchini! Growing up, I remember my Mom making them for dinner, only without the egg and ham. They were used as a side dish with any number of main courses. Either way the pancakes are unique and delicious.